Wow, that’s quite a title I’ve set myself there. Do I feel like writing an exploratory 16 page travel essay featuring mostly the rain? 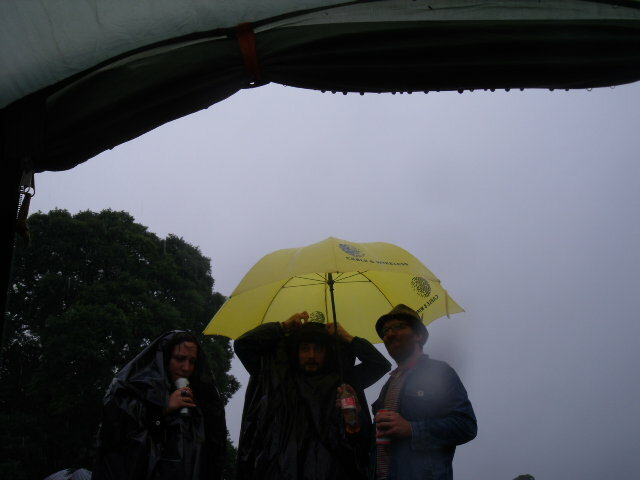 So with Sons of Noel and Adrian, we went to Greenman Festival. It rained. It rained on the way there. When we put up our tent, my relationship fraying by the minute, it rained hard hard hard. During the first evening it rained. We spent the evening in Hal’s camper van staying relatively dry. Day two, up at the crack of dawn (ahem) to soundcheck for the Sons first set. Just about made it there (in the rain) and by 1pm we were ready. 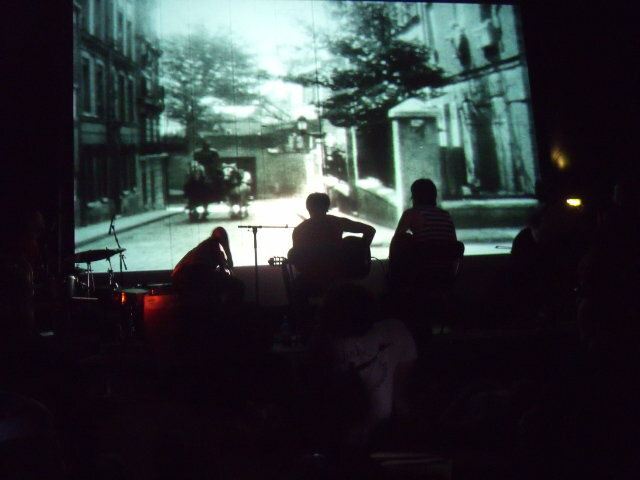 In the cinema tent we played our live soundtrack to The Seashell and the Clergyman by Germaine Dulac, a surrealist film made in the 1920s (while outside it rained). Being a surrealist film and made in the 1920s, it is of course completely incomprehensible and blurry and black and white. Which is great for cymbal washes and spazzy drums. I wonder if it made for good viewing. 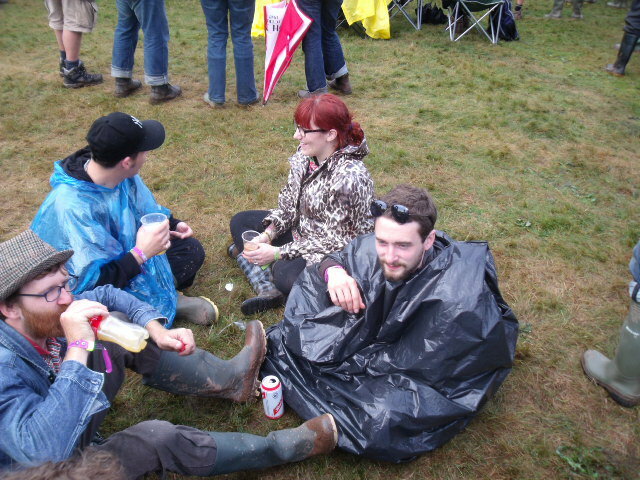 The film finished rather abruptly, ahead of what anyone in the band was expecting apparently, so we played out our last noisy crescendo to a black screen, while people were pouring out of the tent into the pouring rain. Job done. So, we went to watch some bands. The Wave Pictures, Beirut et al. All joyously wet. 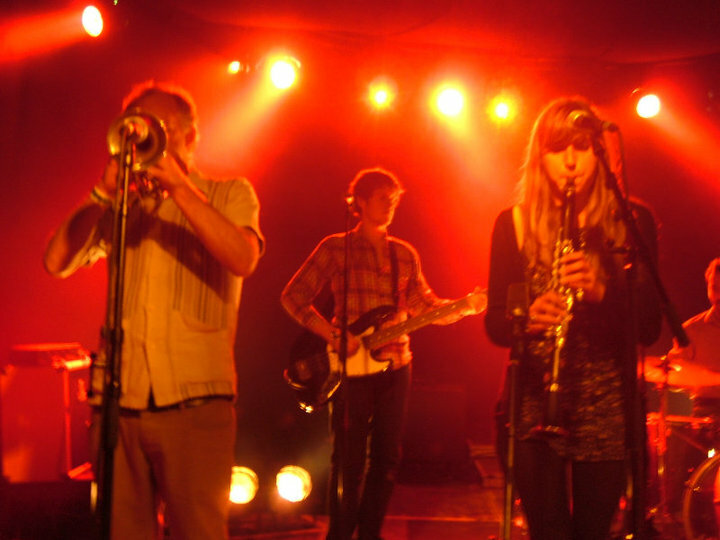 Fanfarlo, Johnny Flynn, Marling, Mumford, These New Puritans, Newsom. Most featured rain, though to be fair, on the sunday afternoon, while my beloved celebrated her birthday, it was dry, it was sunny, we could sit down for more than ten minutes. We played a proper song set on the Sunday (when it was not wet) and then we did a Rough Trade instore set, which was marvellous. High fives to the Mumfords and Marlings of this world and then back to the rain. The journey home was long and tiresome and wet. We had the night off so we dolled ourselves up and went to eat in a sushi restaurant and feel clean and civilized once again. 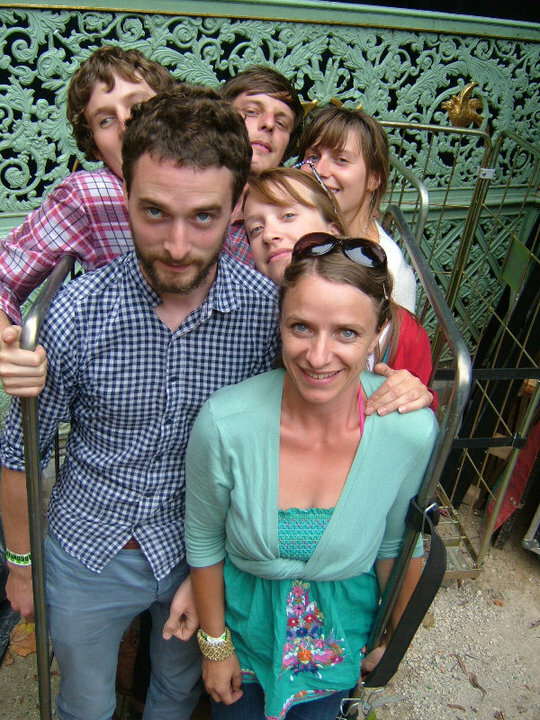 And the next morning, back in the moist damp clammy dank irriguous van, we drove and ferried ourselves to Belgium. 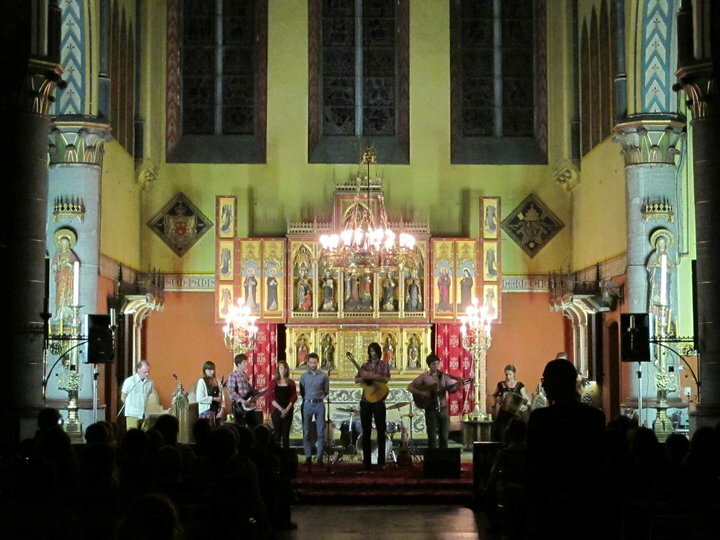 First up playing in a huge church in Gent. The reverberation in the church lasted for seven seconds. That’s an obscene echo. I was having an interesting time of it on drums, trying really hard not to drown everything out and yet still hear what on earth was going on up front. Met some lovely interesting folks who educated me in the ways of hop dancing and how to make a proper cup of coffee and we showed them how much English bands like to eat and drink before a gig. It’s still a novelty for us. Then to Brussels. 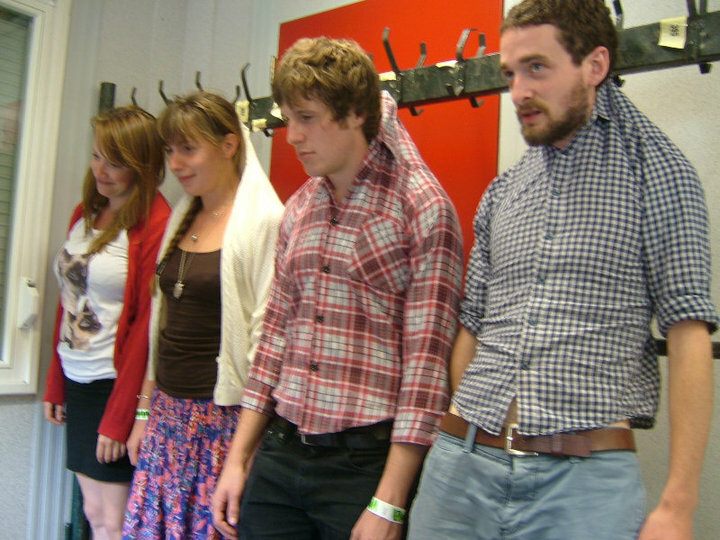 Fun and games in the backstage area. 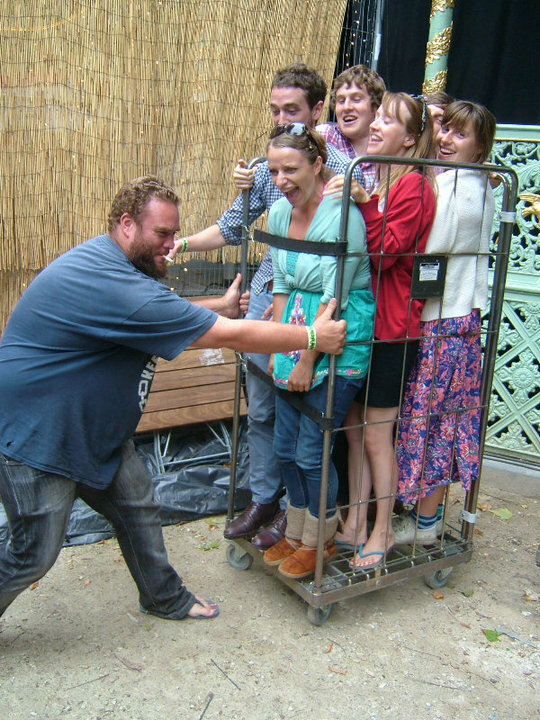 Mike, our stand in violinist, decided to grab us while we…actually I think it’s fairly obvious what is going on. We’re dicking about. 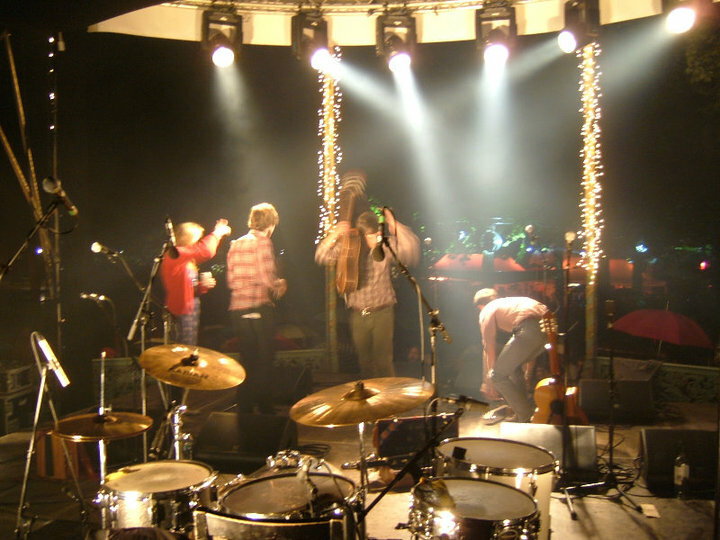 We played to about two thousand people on a big bandstand in a park next to the royal palace. And of course it BLOODY RAINED! Still, they stayed, which I think is testament to the band. You probably stopped reading ages ago, and you’re probably dry. We drove back to one of the nicest hotels I’ve ever personally stayed in, and what followed is probably ample material for at least two blogs and a court case. The only reason it’s not on here is because I don’t have the photos off Jacob’s camera. I wonder if we’ll ever see them. 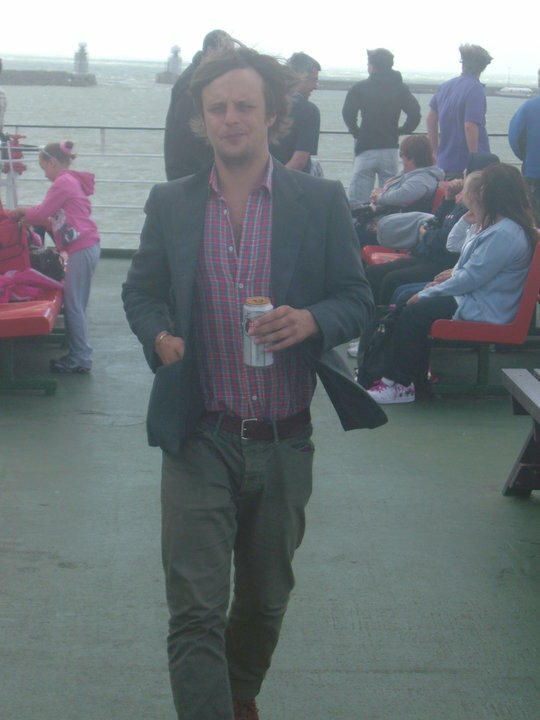 Here’s my favourite unflattering one of Jacob on the ferry, just for a laugh. Oh yeah, if you’re still reading and live near ish Bexhill, you should come watch Laish play at the De La Warr tomorrow! It’s free and we’re playing on the bandstand (praying for no rain) at 3-5.30pm. ← Laish and Curly Hair hit the road – want to help?